Pungmul, also known as nongack or samulnori is a traditional Korean percussive music and dance genre performed by farmers. 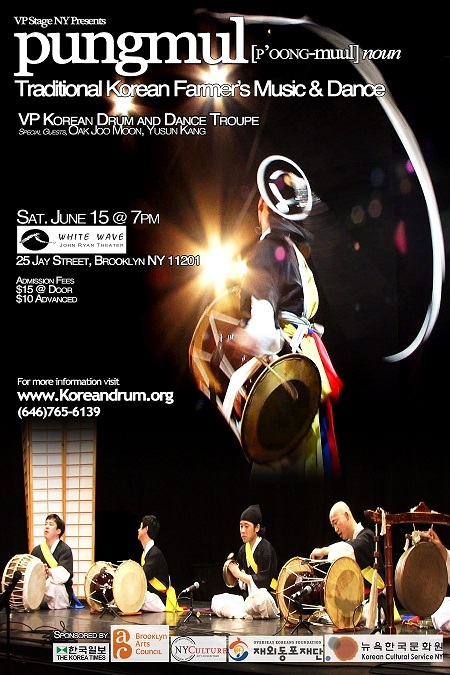 The VP Korean Drum and Dance Troupe, under Vong Pak’s artistic direction, embodies not just the technical methods of this genre, but also the spirit of pungmul, which encourages, entertains, and unifies communities through the power of tradition. This performance brings out the authentic pungmul form - the composition of instruments, costumes, jinpuri (choreography) – as well as seoljanggu and bupo-nori, which is the highlight of pungmul. The janggu (hour glass drum) is the most significant instrument in traditional Korean music, because it is widely used in folk music as well as shaman ritual and court music, and the seoljanggu performance shows how it coordinates breathing, beat, and movement through the performance, and finally, the visual effect of the dynamic energy is materialized through the movement of the sangmo (long ribbon attached hat) dance. Also, the bupo-nori (feather attached hat dance) demonstrates the elegance of the movements that resemble the blossoming of a flower. Artistic director, Vong Pak is a Korean born and Brooklyn based performing artist who has been solidly trained different region's pungmul. He was a finalist for the 2012 NYFA Fellowship in the category of Folk/ Traditional Arts. He has performed at numerous venues and festival in Tri- State New York as well as more than twenty countries. He is a currently a resident teaching artist at East and West International Studies, Hunter College High School, Bayside High school, among other schools. * Note: Pansori is a UNESCO Intangible Heritage of Humanity. The Simcheongga is an old story of 'Simcheongjeon' in opera form. Simcheong is the name of the daughter of a blind man who sought to regain her father's vision by offering rice at a temple. She sells herself to a boatman as a sacrifice to the ocean in exchange for the rice. The Dragon King of the sea, however, was touched by her filial piety and rescues her, reuniting her with her beloved father. A child's love for her parent is the central theme of this story. Jindo is an Island at Southern part of South Korea. Jindo is well preserved for the region’s traditional performing arts include bukchoom, which is a style of drum dance.